Every ThinkTank Photo pack I’ve looked at in the past has been remarkable for attention to design, function and workmanship. The Trifecta 10 is no exception. This backpack is designed with serious amateur photographers and professionals in mind. It’s sleek and it’s sturdy. I make no apologies for my loyalty to the ThinkTank brand. They make good stuff. For serious shooters, the Trifecta 10 offers some great features. There are three ways to get at your gear. There’s a zippered compartment on the right and left sides, each opening one half of the rear compartment. If you want access to everything at once, the rear compartment folds down to reveal all your gear neatly separated by padded inserts. The pack will easily accommodate one standard size DSLR body with lens attached, two to four additional lenses, and up to a 10” tablet, plus personal gear. The only drawback is that a tablet will only fit in the padded sleeve if it is naked. If it’s in any kind of protective case, you’re out of luck. I compensated by laying a small towel over my lenses and placing my iPad on top of that, thus avoiding the protective sleeve altogether. On vacations, I take a 70-300mm lens mounted on my Nikon DSLR, plus an 18-55mm and 35mm prime lens. 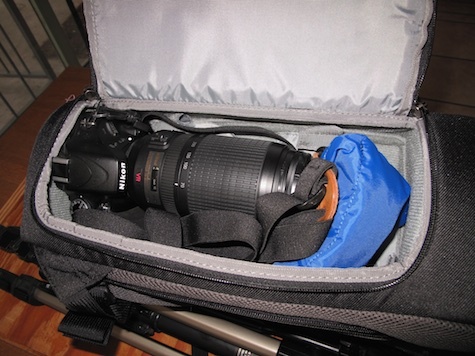 In addition, I take along my Canon Powershot G10 for hikes when I want to travel light. 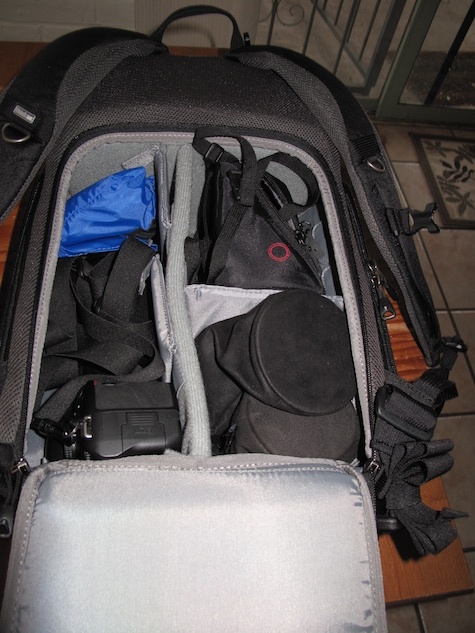 All this gear plus tripod and other accessories easily fits in the Trifecta 10. In addition there’s a separate zippered compartment at the top. It’s adequate for carrying lunch and a few odds and ends. 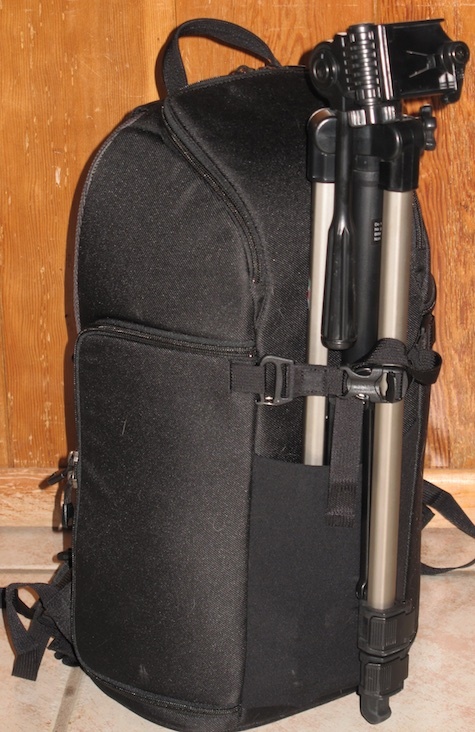 The front of the pack has a vertical pocket that stretches to fit a water bottle or a tripod. 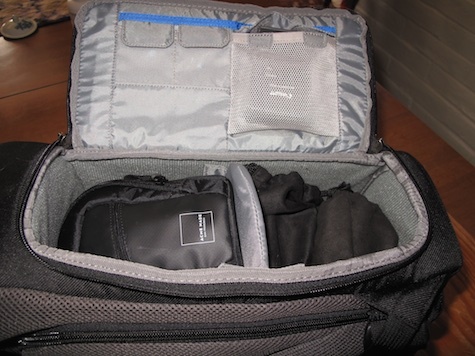 Both the top and side compartments have pockets suitable for SD cards, cables, spare batteries and other accessories.There’s also a rainfly that fits over the whole backpack. The Trifecta 10 has a flat bottom so it will stand on its own. If you’re traveling, you’ll find that the 12.6” exterior width of this pack moves easily through a plane’s narrow aisle and will fit in most overhead compartments. The Trifecta 10 is a hefty backpack made from high density nylon that’s been coated with a water repellent. It also features molded padding on the rear, including firm lumbar support, and heavy duty molding on the shoulder straps, as well as an adjustable sternum strap. If you’re happy taking pictures with your phone, you can still use this pack. Just remove some of the padded inserts in the main compartment and load up with whatever you need for a weekend get-away. The Trifecta 10 is solid and compact. For most shooting assignments, I can’t imagine needing anything else. MyMac review rating: 9 out of 10.